Ash and Misty decide to enter the Whirlpool Cup. Ash and Misty both pass the Whirlpool Cup Qualifiers. 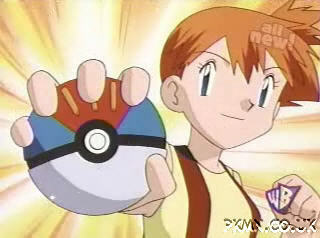 Misty knocks Ash out of the Whirlpool Cup. Misty is beaten in the Whirlpool Cup Final. Ash and the group protect a baby Lugia from Team Rocket. Ash defeats Jasmine and earns a Mineral Badge. Ash sends his Bulbasaur back to Professor Oak. The gang meet Eusine and see Suicune. Ash beats Gary in a race to Mahogany Town and wins an Egg. Ash's Egg hatches into a Phanpy. A Delibird starts following Team Rocket. Ash defeats Pryce and earns a Glacier Badge. Misty's Poliwhirl evolves into Politoed. Ash defeats Clair and earns a Rising Badge. Ash sends his Charizard back to Charific Valley. The gang protect the city of Alto Mare from Team Rocket with the help of Latios and Latias (Movie). Ash meets his old Lapras again. Ash finds a Pokémon Egg. Ash's Egg hatches into Larvitar. Brock's Pineco evolves into Forretress. The gang see an Entei. Casey's Bayleef evolves into Meganium. James trades his Victreebel for a Weepinbell. James's Weepinbell evolves into Victreebel. Ash returns his Larvitar to it's mother, a Tyranitar. Gary returns to compete in the Johto League. Ash recalls his Squirtle and his Charizard. Ash knocks Gary out of the Johto League. Ash is knocked out of the Johto League by Harrison. Ash sends his Charizard and Squirtle back. Misty returns to Cerulean Gym. Brock returns to Pewter Gym. Ash returns to Pallet Town and gets a new set of clothes. Ash leaves all his Pokémon (apart from Pikachu) at Pallet Town and sets off for Hoenn.